Admittedly, seeing the words “death” and “holiday” in the same title can be a bit jarring. But the reality is that during this season of joy and love many people are dealing with either the approaching death of a loved one or grief over a loss that has already occurred. For these individuals there is little “jolliness” or merriment to be found in the month of December. If you are close to someone in this painful situation this year, you may be wondering what sort of gift you can give that will be appropriate and also offer some support to him or her. While your friend or loved one may seem uninterested in exchanging gifts, it is still important to offer small gestures that show your concern and connection; and the gift you choose may actually turn out to be exactly what that person needs right now. Those of us who work with dying patients and bereaved families believe it is important to deal with death openly and frankly, rather than trying to hide or deny the reality that we are all going to die some day. By choosing a gift that acknowledges death you can help foster a healthier approach to the end-of-life in our society and provide an opening for your friend to seek you out for support and conversation. a. The Legacy Letters by Carew Papritz consists of a series of letters from a dying father to his unborn children. This small book is profound and impactful but not too confronting about death and dying. Since it has a masculine perspective on life and death this would be a great gift for a man who may not resonate with some of the other books listed here. b. A Call from Spooner Street by Carol Ascher is a good read for an adult child dealing with the death of an elderly parent. c.	Connecting the Dots and Support for Alzheimer’s and Dementia Caregivers by Judith London are wonderful books for caregivers of dementia patients. d.	The Last Adventure of Life by Rev. Maria Hoaglund is full of helpful tips for families dealing with the dying of a loved one at home. e.	Final Gifts by Maggie Callanan and Patricia Kelley is another wonderful book for families with a loved one nearing death that deals with unique deathbed experiences and communications. f.	Safe Passage by Molly Fumia is an inspirational little book of daily devotions for one who is grieving. g.	Turning the Corner on Grief Street by Rev. Terri Daniel is appropriate for someone in the later stages of grief who is ready for a spiritually transformative look at grief. h.	Home Funeral Ceremonies by Donna Belk and Kateyanne Unullisi is a beautiful book of rituals and ceremonies for a family comfortable with having their loved one die and receive after-death care at home. i. What Really Matters by Karen Wyatt MD is a book of stories about hospice patients, their families and the process of discovering what really matters in death as well as life. a. Walking Each Other Home by The Threshold Choir consists of songs appropriate for the bedside of a dying patient. b.	Rosa Mystica and The Geography of the Soul by Therese Schroeder-Sheker contain beautiful harp and vocal music for the dying produced by her Chalice of Repose Project. c.	Graceful Passages by Gary Malkin is a combination CD and Gift book with music and the spoken word for anyone exploring the issues of life and death. This game is a fun and inspirational tool for creating conversations about death and dying. It would be a great gift for a family facing future loss (which actually describes all of our families) who need some help talking about the end-of-life. The questions contained in the game provide a gentle introduction to a difficult subject. Favorite clothing items like T-shirts, ties, skirts or dresses can be used to make beautiful memorial quilts or pillows. This might be a thoughtful gift for someone close to you who is grieving a loved one if you have access to those clothing items. b. Essential oils such as lavender, frankincense, lemon, sandalwood, tea tree. Read about aromatherapy for the dying here. 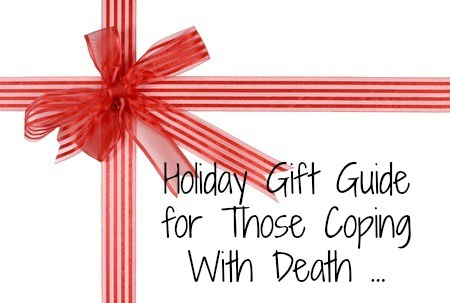 These suggestions are just a beginning to help you start thinking creatively about how to give a meaningful and fitting gift to a loved one facing death, dying or grief this holiday season. Spend some time searching for the perfect present that honors death and supports the one experiencing this difficult path. But remember, there is no substitute for your presence, which is far more important than any other gift you can give. Be willing to spend time with your friend or loved one, even when you don’t know what to say and can do nothing more than sit in silence. Offering your calm and loving attention in the midst of a busy holiday season can be a gift for you, as well. The reality is that death exists always within every joyful occasion, as the dance partner of life; so take a deep breath, open your arms and move with the music. The world will be a better place when we can acknowledge death as a worthy participant in this human existence and this holiday season is the perfect time to begin.